So, what are the thing we need to provide to make our city more friendly for pedestrians? Busy places are Safe places - The more people walking along a route day and night makes it safer and more sociable. Isolated places day or night can be less safe. We need lower speed limits on many roads in the Inner West. The Balmain Peninsular has a speed limit of 40kmph this should be extended across the Inner West. City West Link has a staggering 70kmph speed limit! Parramatta Road, Victoria Road and Liverpool Road through shopping strips and busy bus stops. Croydon Road, Frederick Street, Darley Road, Johnston Street, Marion Street and Ramsay Street have 50kmph speed limits in busy pedestrian precincts! Subject:Notice of Motion: Improving Cyclist and Pedestrian safety on State Roads in the Inner West LGA. Further that the GM request the RMS to carry out an audit of roadside noise and air pollution at the above locations. The Inner West LGA has a number of very busy state roads pass through our neighbourhoods. Schools and Childcare, Business Precincts and Restaurants are located on these roads making them busy pedestrian precincts and increasingly popular cycling locations. The NSW Government gave approval to Westconnex Stage 3 in April. This approval included the marshalling of trucks at Whites Bay. The plan involves trucks travelling along City West Link, Parramatta Road and Johnston Street. Westconnex will also induce more traffic on these roads. The government is also investigating establishing a major construction materials port at Glebe Island, which will also generate truck movements on these urban roads. 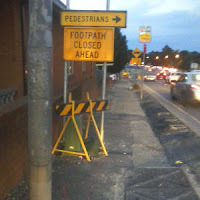 "Install traffic calming, pedestrian refuges and crossings in busy urban places across NSW, to improve pedestrian and bicycle rider safety, and reduce casualty crashes. Source: Liveable and safe urban communities; http://www.towardszero.nsw.gov.au/roadsafetyplan. The cost of preparing these letters is $150 of staff time.